Hybrid Financial Group has become a national leader offering innovative Workers’ Compensation Insurance programs. HFG specializes in developing innovative technology and establishing channel partnerships with brokers, payroll companies and carriers. HFG is working with brokers, consultants, and clients to deliver cutting edge products and services. We can work out a custom solution to work out nearly any type of need of risk situation. We facilitate thousands of workers comp codes and specialize in hard to place business. These codes can also participate in the zero down workers’ compensation program. We can work out a custom solution to facilitate nearly any type of need or risk situation. Intelligent and immediate underwriting is possible through the use of data analytics quoting technology. We can work with any type of risk. Contact us right away for a quick and simple quote for your own company! The outdated “best guess” approach to premium calculation is a thing of the past. Now your company and clients can eliminate huge down payments and dreaded end of year audits! 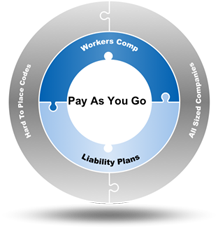 This is the only way to offer an actual Pay As you Go Workers Compensation program. Anything else is simply a look-alike program that does not prevent audits and additonal lump sum premium payments. Hybrid Financial Group features pay-as-you-go technology that revolutionizes traditional Workers’ Compensation premium calculation. Don’t be fooled by look-alike programs that are nothing more than no interest premium financing. Without the sophisticated “Net Rate” premium calculation, your company could end up owing considerable money at the end of the policy and would likely be audited for that purpose.